Paramananda (1884–1940) was a swami and one of the early Indian teachers who went to the United States to spread the Vedanta philosophy and religion there. He was a mystic, a poet and an innovator in spiritual community living. Paramananda was born on 5 February 1884 as Suresh Chandra Guha-Thakurta, the youngest son of a prestigious family, in the village of Banaripara. The village is in the district of Barisal, which was then part of East Bengal in British India and is now part of Bangladesh. His father, Ananda Mohan Guha-Thakurta, was well known as a progressive, a champion for women's education, a legacy he was to pass along to his sons. His mother, Brahmamoyee Basu, bore eight children before dying of cancer in her early forties, when Suresh was nine years old. Suresh was known for his affectionate nature and cheerfulness. When Suresh was sixteen, his father began to lose his eyesight. As a result, Suresh read devotional texts aloud and one that was particularly compelling was a collection of "Sayings of Sri Ramakrishna," a revered saint who had died fourteen years prior. On his seventeenth birthday, Suresh joined a group of older men from the village in a journey to Belur Math to visit the monastery and temple founded by Ramakrishna's disciples. There he met his teacher, Vivekananda, who was the foremost disciple of Ramakrishna and the first swami to teach in America. Paramananda was initiated a month before his eighteenth birthday, becoming a monk (sannyasin) of the Ramakrishna Order and the youngest disciple of Vivekananda. The President of the Ramakrishna Math, Brahmananda, would call Suresh "Basanta Kokhil" [spring-bird], or simply "Basanta" [spring] and that became his new nickname. He trained under the mentorship of Ramakrishnananda, also a direct disciple of Ramakrishna, and founder of the Madras Math, a thousand miles south of Calcutta. Paramananda was sent to America in 1906 at the age of twenty-two to assist at the previously established New York Vedanta Society. He lived and taught there until 1909, when Paramananda established the Vedanta Centre of Boston. He lectured throughout the United States, Europe and Asia for thirty-four years, until his death in 1940. He founded four centres still thriving today, two in the United States and two in Calcutta, India. The American ashramas are in Cohasset, Massachusetts and La Crescenta, California. Like his teacher, Vivekananda, Paramananda believed in equality between men and women. 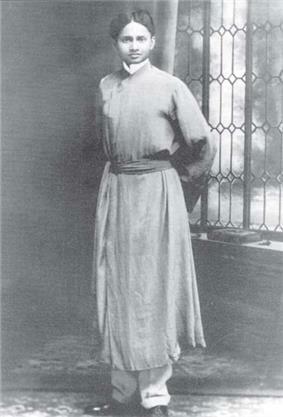 He established disciplined communities of nuns under the supervision of Sister Devamata (1867–1942) his American first disciple, whom he ordained to teach Vedanta from the platform in 1910. Throughout the entire history of the community, women were accorded positions of leadership in all areas of the work. The first Indian woman to join the community was Gayatri Devi (1906–1995), who was brought by Paramananda in 1926 to be trained as one of his assistants. She became the spiritual leader of the centres upon Paramananda's death in 1940 and the first Indian woman to be ordained a teacher in America. Paramananda founded the "Message of the East" in 1909, the first Vedanta periodical published in the United States which continued for 55 years, offering articles, poetry and commentary on all religions in its monthly, and later quarterly, magazine. He authored translations of the Bhagavad Gita and The Upanishads as well as four volumes of mystical poetry, "The Vigil", "Rhythm of Life", "Soul's Secret Door" and "My Creed" and many other books and publications.